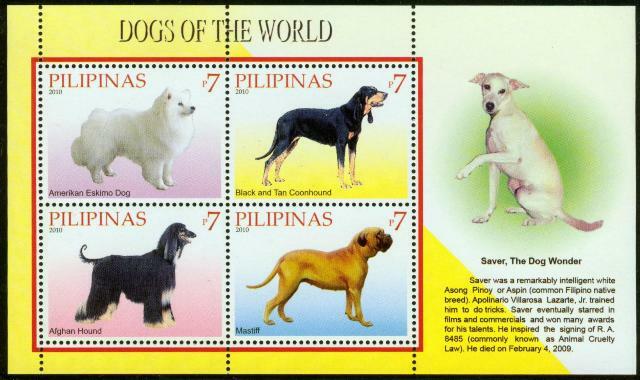 Saver, the Dog Wonder, a Filipino Breed - Featured on the Souvenir Sheet but not as a stamp - One of the interesting feature of the souvenir sheet is Saver, a remarkably intelligent white “asong pinoy” or Aspin (common Filipino native breed). 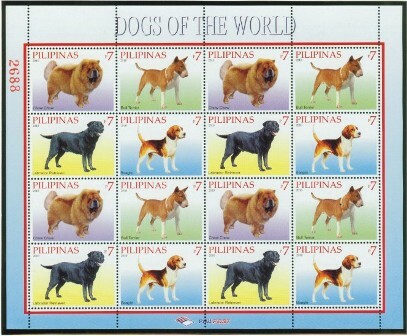 Saver, who was trained to do various dog tricks by Apolinario Villarosa Lazarte, Jr., is a multi-awarded dog and starred in many films and commercials. He also inspired the signing of R.A. 8485, which is commonly known as Animal Cruelty Law. 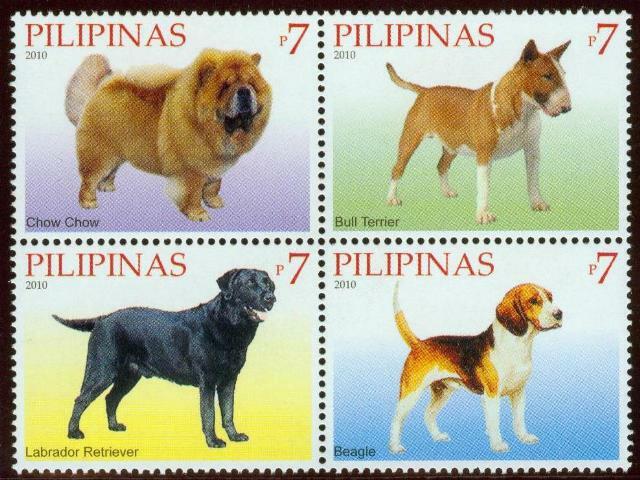 Chow Chow – An ancient breed of Chinese origin, the Chow Chow is a member of the spitz family. As a working breed in its country of origin, the Chow was used to guard, hunt and work as a cart dog. Bull Terrier – Originally called the Bull and Terrier, this British breed represents a cross between the Bulldog and the now extinct White English Terrier. Bull Terriers are friends to all, but because their first job was that of pit fighter, their feisty instincts die hard. Labrador Retriever – This dog has a retrieving jones. Lead a Lab to a body of water and it will retrieve all day: balls, sticks, and even children who might happen to go for a swim. Descended from dogs found in Newfoundland by explorers, fishermen and settlers, the Labrador Retriever evolved by natural selection. Beagle – Beagles have a long history, but the most famous of them all, of course, is Snoopy, whose delight in food and travel exemplifies the breed. This small, popular trail hound, used chiefly to hunt rabbit and hare, was developed in England. American Eskimo Dog – The Dog Beautiful is an appropriate nickname for this breed, which has a thick, snow-white coat, erect ears and a plumed tail, as well as the square build and wedge-shaped head that mark it as a member of the spitz family. Black and Tan Coonhound – A specialist in night trailing the raccoon, the Black and Tan Coonhound is a direct descendant of the Bloodhounds that were imported to the English colony of Virginia. Males measure 25 to 27 inches at the shoulder; females two inches less. Afghan Hound – With a flowing silky coat and exotic features, the Afghan Hound is the model/actress of the dog world, admired for its beauty, grace and flashy style. Mastiff – Sometimes known as the Old English Mastiff, this giant breed has been known for centuries as a war dog, hunter, estate guardian and blood sport combatant, but today it is a gentle companion and valiant protection dog.